Windows in West Vancouver are much more than ways to see outside. They can be used as lighting fixtures, or main display in storefronts. Whether you are using your windows as a showpiece or just a way to experience the beautiful views the city has to offer, dirt and grime are not pleasant. Our West Vancouver window cleaning ensures that your windows are working for you, however you need them to. Wiping and cleaning windows might seem like just another chore, but getting proper results is an art form! The right tools, the right experience and the right attitude make all the difference when it comes to getting your windows clean. 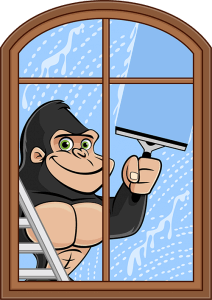 Our Gorillas approach your window cleaning on an individual basis, using the tools and techniques that work best for your space. The windows around your property are susceptible to exposure. When dirt, dust, salt or debris is left sitting against the surface of your windows, materials can begin to erode. Glass is porous, allowing small particles to seep inside and degrade your windows from the inside out. When it comes to making the most of your windows’ life span, our West Vancouver window cleaning is a must! Gorilla technicians do not just leap into the field. We are called experts for a reason! Each and every one of our Gorillas goes through an intense training process before ever setting out into the field. All of our Gorillas are local to your area and know exactly how to treat your property! It is dealers choice when it comes to your West Vancouver window cleaning. Our Gorillas are not afraid of a little hard work, cleaning low level windows by hand with eco-friendly cleansing agents and rubber squeegees. This keeps us up close and personal with your windows – what a better time to clean those frames and sills. For those hard to reach places, our Gorillas come equipped with with water-fed poles. These poles allow us to clean windows up to 4 storeys high. What could be better than having our Gorillas swing into action from the ground floor?